Medellín in Colombia, once known as one of the world’s most notorious cities in the days of the Medellín Cartel, is now hot again, but for all the right reasons. The city is fast becoming one of the most popular destinations among young New Zealanders benefitting from the Prime Minister’s Scholarships for Latin America (PMSLA). Eleven University of Auckland students selected for the 2019 round, including five doctoral candidates and six undergraduates, will complete 12-week internships with businesses in Medellín, and will receive valuable exposure to language, culture and business in the region. I would wake up each day knowing I would smell, hear, see or do something I would otherwise never have done. This is one of the positive outcomes from a visit to Medellín last year by staff from the University’s International Office, along with the Dean of Graduate Studies and head of the University’s PhD programme, Dr Caroline Daley. 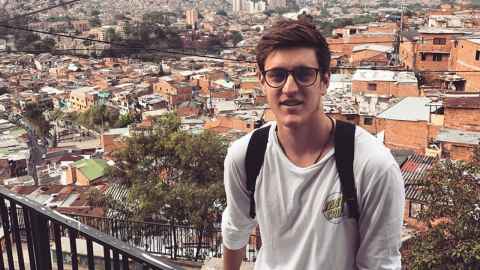 University arts and commerce student Jonathan Burkin, who recently returned from two semesters' study abroad at EAFIT University in Medellín, said he found living there a transformative experience.